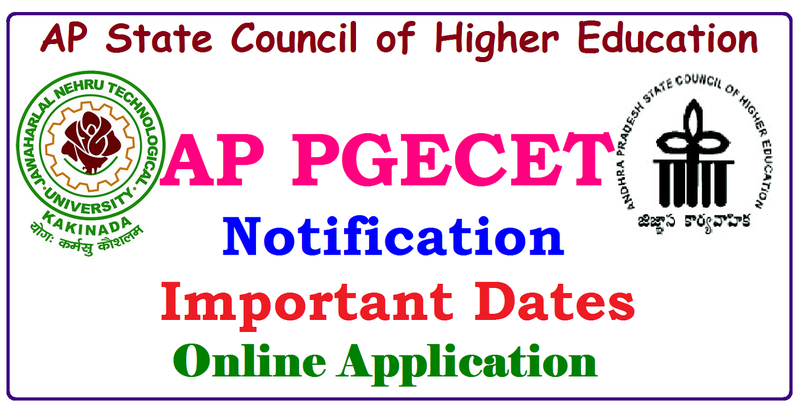 Andhra Pradesh Post Graduate Engineering Common Entrance Test which also known as AP PGECET 2017 notification announced by Andhra University, Visakhapatnam on behalf of Andhra Pradesh State Council Higher Education (APSCHE). Applications are invited from candidates who intend take admission into M.E / M.Tech / M.Pharmacy / Graduate level Pharm-D (PB) regular professional courses offered in Universities in Andhra Pradesh including affiliated colleges for the academic year 2017-2018. Eligible and interested candidates may submit their applications through online mode only. Candidates have to pay Rs 800/-(Rs 400/- for SC / ST) for test.In case a student want appear for more than one test separate registration fee has to be paid for each test.The registration fee may be paid at any AP Online centers and also through Payment of Gateway (Credit Cards / Debit Cards / Net Banking). 2. Candidate should be belong to the state of Andhra Pradesh only and should satisfy local / non-local status requirements as laid down in the Andhra Pradesh Educational institutions or 1974 as subsequently amended. 1. The Candidates should have passed recognized Graduation in Engineering / Technology / Pharmacy . 3. For Pharmacy Courses: Candidate should obtain at least 55% for OC & BC category and 50% for SC / ST category. 4. Graduate level Pharm-D(PB) course : Graduate level 3-year program (UG) in pharmacy with B.Pharmacy as entry qualification approved by pharmacy council of India,New Delhi. 5. Candidates should have passed M.Sc / M.A / M.C.A Master Degree in any branch of Science / Mathematics / Statistics / Computer applications and Dual degree courses with at least 50% marks (45% marks for reserved category) in the qualifying examination. 6. Candidates who are compartmentally passed / appearing for the final year are also eligible to apply.Candidates must be required to produce marks memos and pass certificates at the time of admission. 7. Before applying for PGECET the candidate verify the eligibility for various universities to write a particular test and seek admission into the relate course. Eligibility criteria fixed for each course in given official website. 8.The qualifying degree (professional courses) obtained under distance mode must have AICTE / DEC approval. There is no age restriction for appearing for entrance test. However maximum eligible age for obtained Fee / Scholarship as per AP Govt rules. The candidate after satisfying the eligibility criteria PGCET, can apply online mode only.The registration process will be held in two phases, in the 1st phase the aspirants are required to pay the application fee while in the second phase, the candidates can fill the online application and submit it. Candidate shall take printout of the application and store it for future reference. 1. Candidates visit nearest AP Online center. 2. Provide all necessary details Name,Date of birth,Mobile number and Make the payment. 3. You will receive a receipt of fee at above centers containing "Journal number ". Can proceed will submission of application. 1. Login to the official website http://sche.ap.gov.in/PGECET, clicking on "Fee Payment" select the post applying for PGECET and District belongs to and enter the personal details. 2. Choose the appropriate option mode of 'payment of Gateway' and select the Bank .Clicking on 'make payment' and submit. 3. Completing the banking process shall receive "Journal Number",can proceed will submission of application. 1. Login to the official website http://sche.ap.gov.in/PGECET, go through the instructions to fill up the form.Click on the "Fill Application" link. 3. The following registration fee payment procedure webpage will appear on the screen.Select appropriate registration fee payment mode AP Online (or) Debit / Credit card and click. 4. After clicking the button the following "Payment verification" webpage will appear on the screen.Fill all the details in the respective fields completed after clicking the button "Proceed filling application form"application will be displayed. 5. 8. Fill the entire academic, study , reservation and personal details . Upload photo and signature and click "Save" button. 6. Finally click submit button,take the printout application mentioning the "Reference Id" (Registration Id). Click on appearing as " Print your Application" link, enter the required details and click submit button.